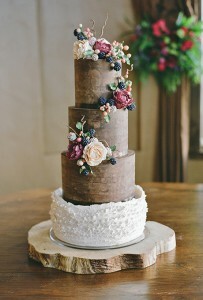 I love the bark-like look of the top tiers of this cake – it gives the cake a nice rustic vibe without being too harsh. The bottom tiered features beautiful ruffled icing, giving the cake a bit of glamour. The pops of color from the cascading berries and blooms are dark and dramatic – perfect for this season! It really is a perfect cake for a fall wedding. And displaying the cake on a slab of wood is genius. You can find this cake here. It was created by Sweet and Swanky Cakes.